Thus far the Comment Commanders have sustained very few infantry casualties. 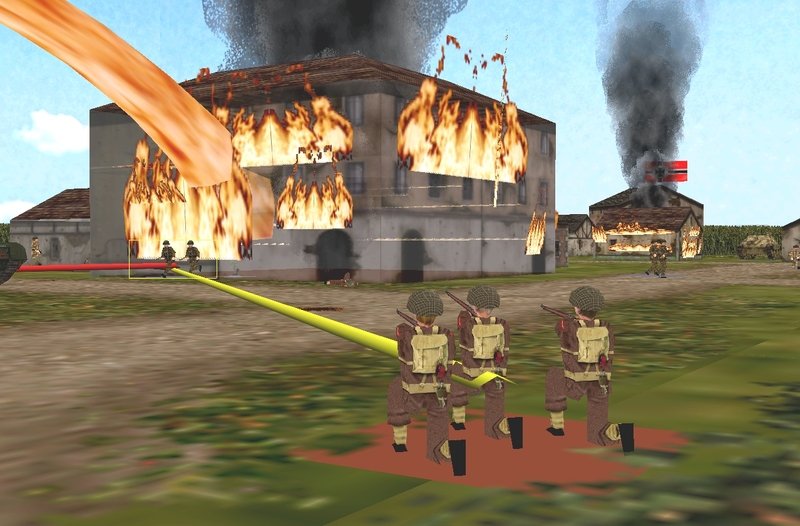 In the west the bulk of Lt. Nerbul’s rifle platoon, together with a flamethrower team, wait patiently for the Englanders to emerge from ‘West Wood’. 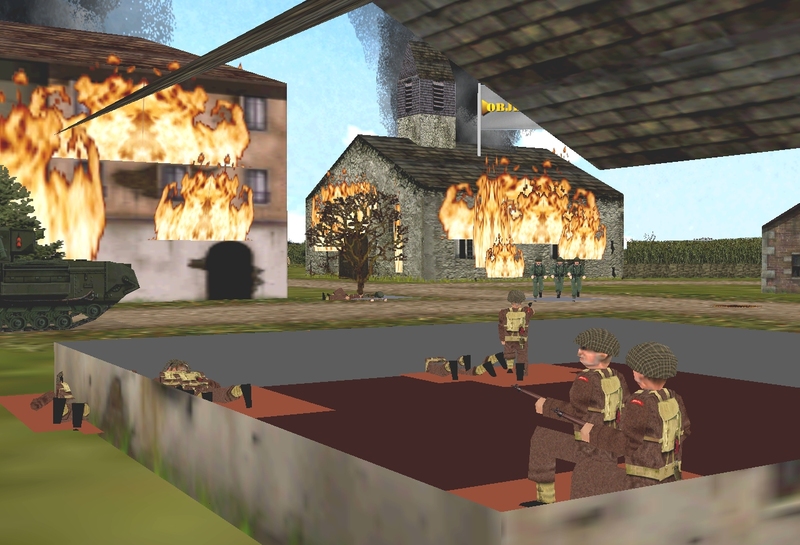 In the centre, Larcher’s pioneers are in the process of evacuating the blazing hotel, while, close-by, the lion’s share of Schenck’s recently arrived paratroopers endeavour to influence the furious firefight raging in the middle of Caent. During the course of Turn 14 one part of this tiny tank-short Kampfgruppe goes from intact to in tatters. 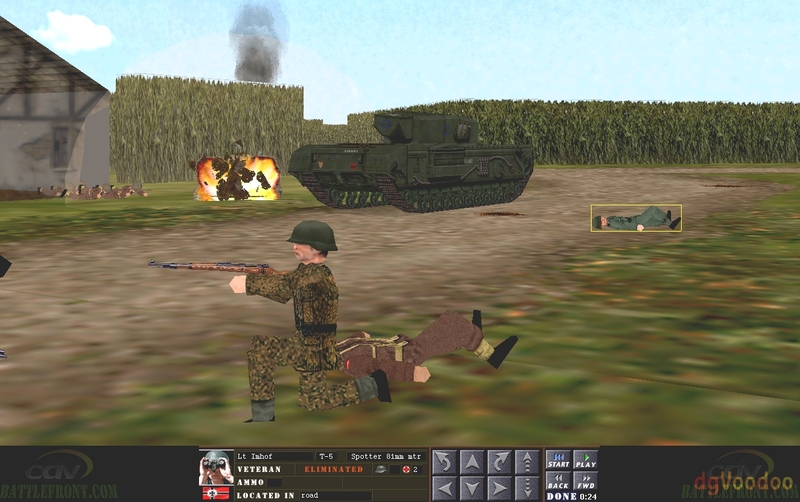 (Overlordy is an open-to-all game of Combat Mission: Beyond Overlord in which German forces are orchestrated by commenters while British units are computer controlled. 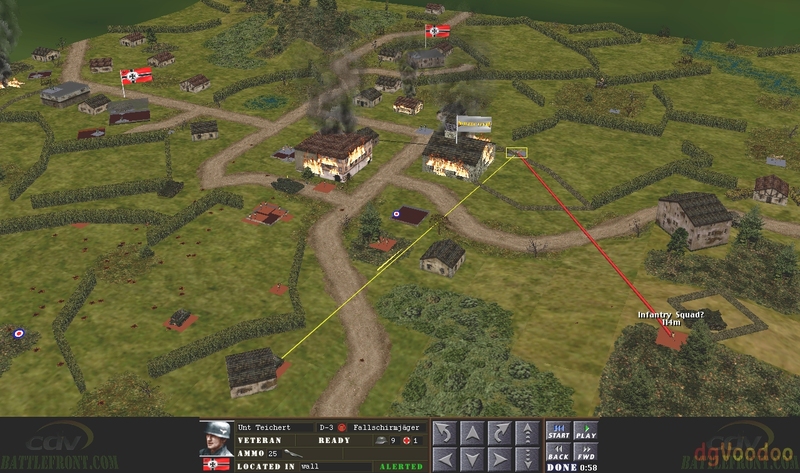 For a scenario outline and summaries of earlier turns, click here). The unfortunates are the men in pea-dot pattern smocks. 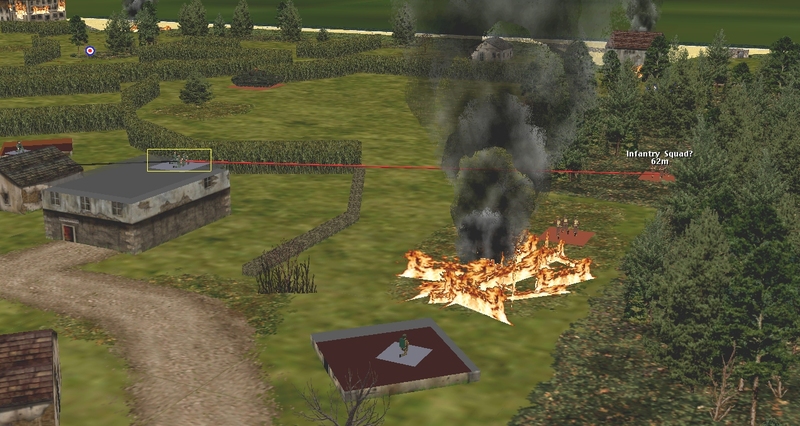 The two pioneer squads under Larcher’s command choose to leave their flame-wreathed digs via the nearest rather than the safest exits and the decision, combined with some unwise, unsanctioned aggression, leads to their near-total destruction. All but two of Stein’s squad are mown down during a Butch Cassidy and the Sundance Kid-style transit of k20 (the square containing the KOed Churchill). 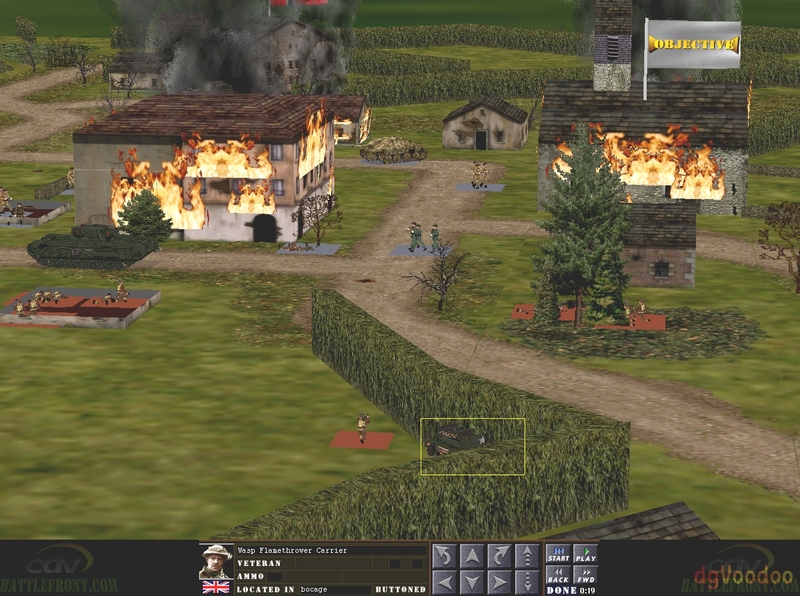 Mogg and his men flee through the more sensible eastern doors, then, in a suicidal act of bravura sure to please Berlin firebrands like Harmodios, decide to storm the Tommy-stuffed maison at k19! 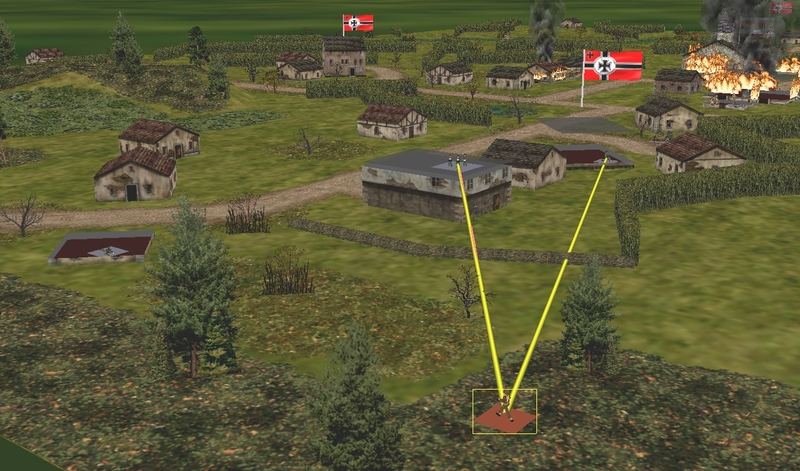 The assault ends predictably, the last SS man perishing close to the spot where, moments earlier, Imhof, the mortar spotter, took his last breath. 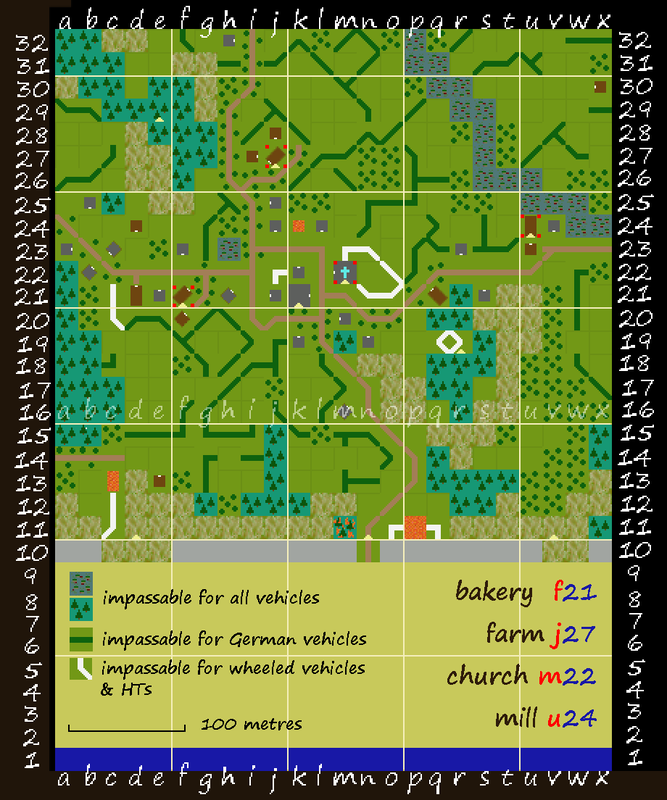 Another unit that chooses doomed derring-do over dutiful discretion in Turn 14 is the stray rifle squad near the church. Like Mogg’s mob they ignore orders and head for the hornets’ nest at k19, guns blazing. By the time the Brits drive them off, they’ve lost more than half their number and their morale window is displaying a bright red ‘ROUTED’. Now the bad news is out of the way, here’s the good. 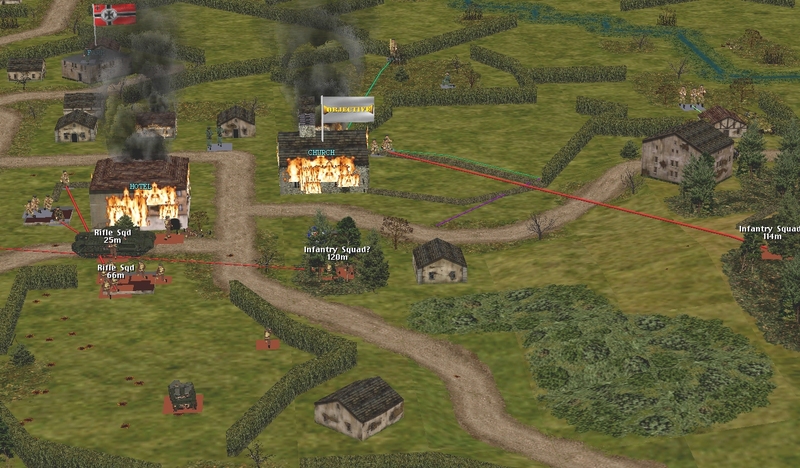 The Green Devils at l22 move to their new position behind the churchyard wall swiftly and painlessly, and their commander, Schenck, and comrades by the mill stream follow their orders with similar efficiency. 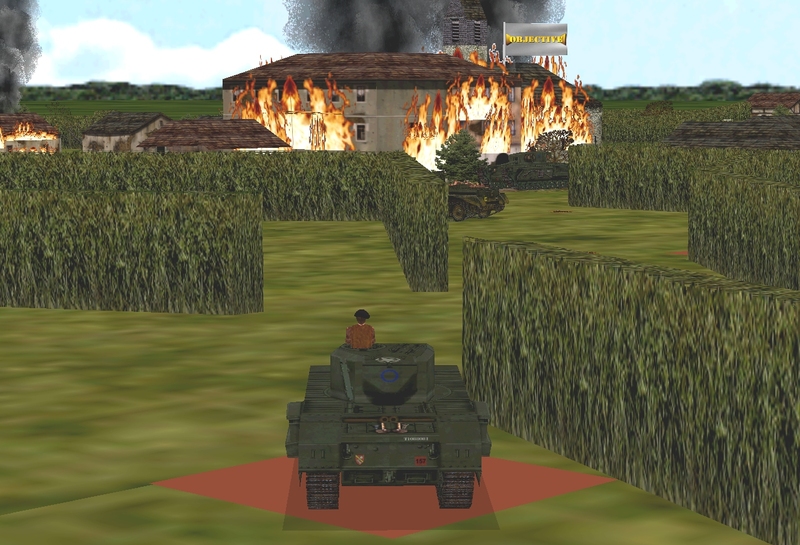 Wodtke and the Panzerschreck team also resist the temptation to tweak, freelance, or loaf. In the west, Nerbul’s men finally run out of patience at T+10 seconds. Under fire from the bakery pickets, the squad leading the British advance on our right decides to pick up the pace rather than go to ground. It’s a fateful decision. As they push on, Gruber, our lava distributor, stands up, steadies his fire lance on a windowsill and opens the taps. 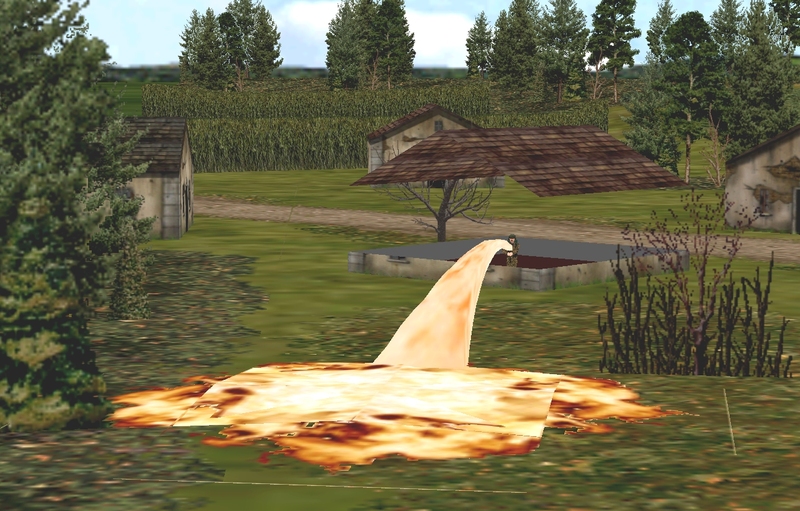 The second gout of napalm turns the patch of pear trees at b21 into a lake of hungry flames. 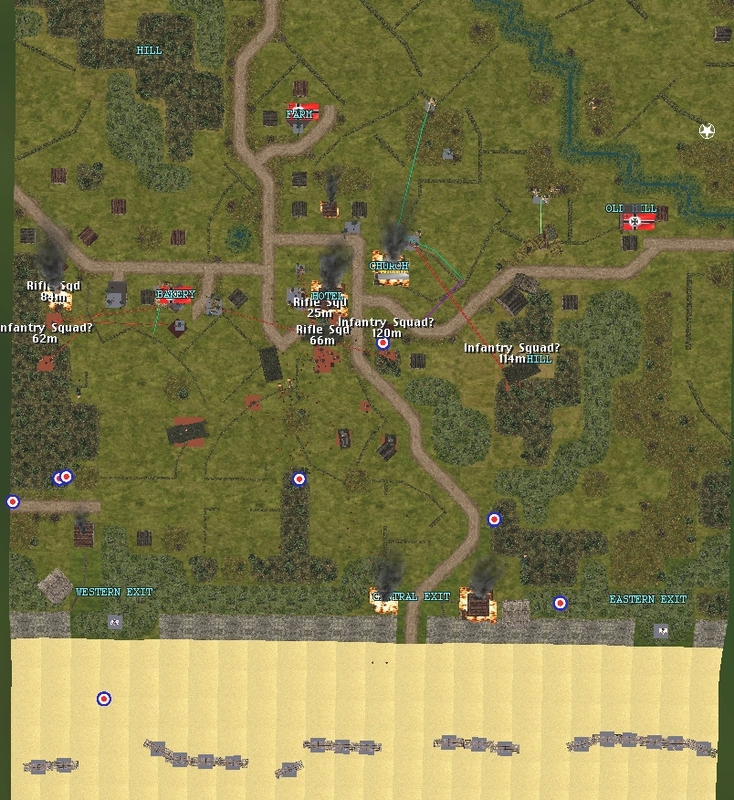 Singed and scared, the British van heads back the way it came, while the men watching West Wood from d and f21 turn their attention to alternative targets. Vehicular news? Apart from an early Wasp sting on the hotel and some late Bren Gun work from the Universal Carrier prompted by the appearance of the FJ squad at n23, the AFVs focused on movement rather than molestation in this action phase. An eleventh-hour order change possibly saved the Wasp’s bacon. 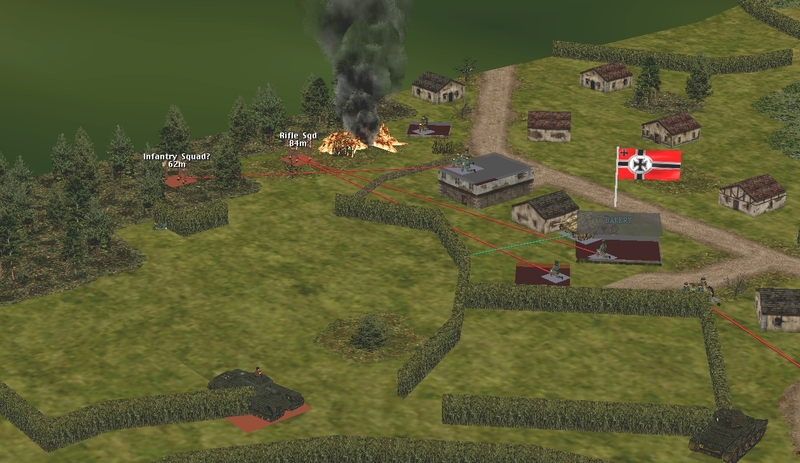 The smoke that had been screening the British arsonist from our TD vanished early in the turn, but as the Hetzer was already hurrying westward and the Wasp was quick to see the danger and start reversing, no shots were fired. Turn 15 promises be much more eventful from an armour perspective as the AVRE is heading in the direction of the hotel and the Hetzer is now relatively well-positioned for ambuscade. I’ve annotated the image above in an effort to clarify the complicated situation south of the hotel. The numbers indicate how many men remain in the various British squads. 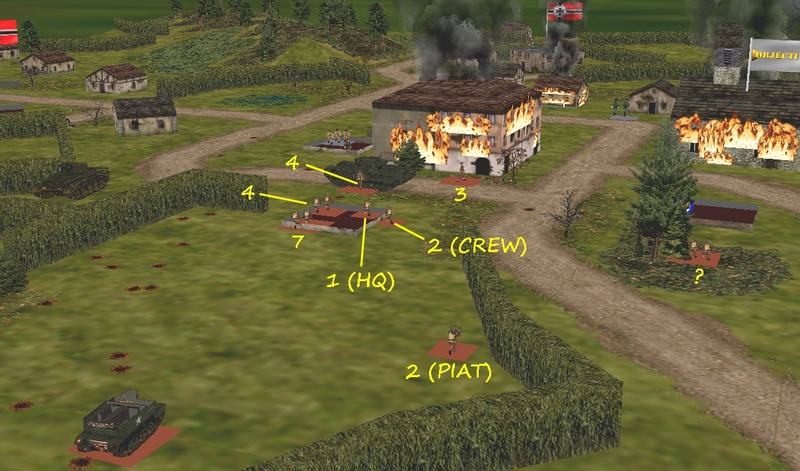 Tagged with AAR, Combat Mission, communal Combat Mission, overlordy.